CC and I were on vacation. We’d driven countless miles on twisting, hilly country roads to reach this place. We pulled up to a booth not unlike those on toll roads, paid our fee, and continued on into the park. A few more miles down, we came to the parking lot, which was bustling with traffic. The attendees were of every sort – the young and the old, large groups and solitary tourists, even whole families with babies in tow. We parked, got out of the car, and made our way towards the focal point of the location. At first glance, it looked like a huge billboard, but it would properly have been called a mural. It faced a narrow road that was closed to traffic. Hundreds of people were milling about, many seemingly oblivious to the mural; some staring intently at it. A clue to its theme could be heard in the air – a recording of the Beatles singing “Hey Jude” played on an endless loop, though the recording had been remixed to add heavily distorted bass notes and other electronic effects. The mural was said to have been a collaboration between Paul McCartney and John Lennon. A simple sign nearby identified it as “A Visualization of the Song ‘Hey Jude’” It seemed to my eye to be some sort of collage, containing separate, unrelated elements. I could not see any sense to it either as a whole or in its individual parts. As an aid to the artistically naïve, a thick piece of Plexiglas was overlaid on the mural, calling out particular elements and explaining them in detail, thus obscuring parts of the mural. In short order, I had parted company with CC and moved to the balcony of a building across the road from the mural, from which one’s view was unimpeded by the heads and hats of other tourists. As I stood there, trying to make out the text on the mural, a set of double doors opened behind me and a group of people exited the building. A woman’s voice on a loudspeaker then calmly announced, in an English accent, “Miss Nancy Simmons of Cambridge University will now give a lecture on her analysis of the mural. Your six dollar admission fee to the park includes this lecture.” After no more than a few seconds of internal debate, I decided to skip the lecture. I made my way down to the ground level, where I met up with CC. We agreed that we’d seen quite enough of this attraction and that it was time to move on. And I woke up. This is what all that driving can do to your brain. Let’s be clear on this point: The mural does not exist, though God knows, the remix of “Hey Jude” could be real. That dream occurred this morning, less than 48 hours after I’d returned home from two weeks on the road with CC. In no way does it represent my feelings about our vacation, except as a reminder that one must be selective about which attractions one visits in this great land. There are wonderful, stunning sights worth seeing and thoughts worth thinking… but there’s a lot of the other stuff too. Happily, we’d done our homework and only took in sights that were commensurate with our interests and intellects. I say that not to brag, but to encourage others to do the same sort of prep work. Richmond has a population of a little over 200,000, so it is merely the fourth most populous city in Virginia. Still, there are few cities in the U.S. that can claim such a wealth of historical significance. CC and I quickly came to feel that we could have spent our entire vacation there without exhausting its ability to fascinate us. Rather than offering you an overview of Richmond’s many charms, I will talk about the two historical sites we visited in the course of a memorable day. Our first stop was the Maggie L. Walker National Historic Site. It may not be the first place, or even the tenth place, you would think of visiting in Richmond, but it quickly became apparent that it richly deserves its National Historic Site status. The house itself is on a block of Victorian homes. If you were driving along 2nd Street, you might not take much notice of them other than the fact that one home seems more decked out than the others with its brightly painted brickwork and well maintained awning. But once you enter the house, a remarkable story is brought to light. Maggie L. Walker was born in 1864. Her mother was a former slave and her father was a white Irish immigrant. Virginia law at the time prohibited interracial marriage. Maggie was raised in a meager, hard-working environment, but she leapt far beyond the difficult circumstances of her upbringing and ultimately became the first female bank president of any race to charter a bank in the United States. She was a successful business person and a community leader in an era when this was a seemingly unimaginable aspiration. In her time, she was one of the most well known African Americans in the country, though she is apparently far less well known today. Her home, which we toured extensively, is a 28 room mansion, still outfitted and decorated much as it was when she lived there. Her story can be an inspiration to anyone of any race or background. Here is where I get to talk about one of our great strategies in planning this vacation. We traveled out of season, i.e., we went after school had gone back into session. When we arrived at the Walker House in the late morning, we were informed that we were their first visitors of the day. Our tour guide, an elderly ex-Army man named George, had only the two of us to show around the house, so there were plenty of opportunities for questions and answers, in addition to which we could move at our own pace and focus on the objects and stories that particularly interested us. Take it from me – travel out of season to maximize your experience. 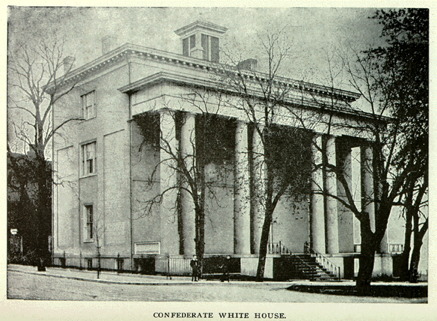 After leaving the Walker House, we drove for about ten minutes and covered about a million miles, for our next stop was the White House of the Confederacy (which I will refer to as the WHC), the executive mansion where Jefferson Davis and his family lived for most of the Civil War. Old photographs tell me that the mansion was once surrounded by a generous amount of open land, but nowadays, it sits rather incongruously surrounded by hospitals and medical school buildings. 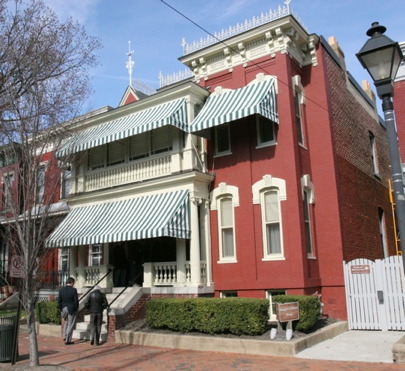 Unlike the Maggie L. Walker house, which is operated by the National Park Service, the WHC is privately owned and operated. It is next door to the Museum of the Confederacy, which time constraints prevented us from visiting, but we had nearly two hours in which to tour the WHC. It is a remarkable storehouse of historical artifacts. Room after room has been maintained in a Civil War era state of preservation, with furniture, fixtures, paintings, clothing, and all manner of other items on display. It is easy to imagine President Davis and his family living their lives there amidst all of the finery and gentility, albeit while fighting a losing war and coping with all of the uncertainties that accompany such a life. Still, it was impossible not to be struck by the contrast between the Davis family’s lifestyle, attended as they were by various servants and slaves, and the harsh realities of Maggie L. Walker’s early life; remembering that for all of Walker’s later success, she was born into Richmond as a poor black child in 1864 while across town, Jefferson Davis was leading a government that was fighting for the right to keep people like her enslaved, among other goals. Ah, but let me end on a lighter note. As an individual visitor, you are not obliged to consider the heavier implications of these places. If you entered as nothing more than an aficionado of antiques and Americana, you would find more eye candy in these places than you would in a dozen episodes of Antiques Roadshow. And if, during your visit, you happened to learn something about the people who lived there and their life stories, it would only enrich your experience. Stay tuned; there’s still plenty to come, including our visit to the home of a man central to defining what it means to be an American, a man whose writings about individual freedoms have inspired millions around the globe, yet who owned slaves. Or maybe I’ll write about the people who came here over four centuries ago who laid the groundwork for what was to become the United States. Or maybe I’ll write about CC getting her feet wet in a large body of salt water. I’ll get back to you.